The Kareri Lake in Himachal is a high altitude, shallow, fresh water lake at the south of the Dhauladhar range located approx 9 km North West of Dharamsala in Kangra district, Himachal Pradesh. Its surface is 2934 metres above the sea level. Kareri Lake is best known for being a trekking destination in the Dhauladhars. It’s an easier trek for everyone. It is frequented mostly by Gujjars and Gaddis from the nearby villages because of extensive pasturelands. Clusters of dense conifers and different kinds of perennial flowers are a rare treat offered by this place. 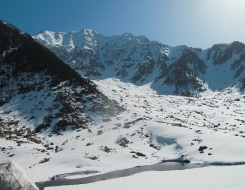 Snow melting from the Dhauladhar range serves as the source of the lake and the stream, Nyund is the outflow. Since the source is fresh melting snow and the lake is shallow, water visibility is very high and in most places, the lake bed can be seen. The start Point for Kareri Lake trek is Ghera (N32 15.893 E76 17.094, 1306 mts), District Kangra with Kareri Pass being the highest point. In the morning half day city sight seeing tour and afternoon transfer to Delhi railway. Station to board Shalimar express train at 15:55 hrs. Dinner in pantry car. Overnight journey. Today we will start our day one trek to Kareri village. The trek goes through the pine forests and cross several villages on the way. Dinner and overnight stay in tents. Trial goes through mixed forests of oak, rhododendron and pine. First 2 km is a level walk an then there is steep ascent along Kareri Nallah (stream) which has to be crossed over a number of times over improvised wooden bridges. Night stay in tents at bank of Kareri Lake. Dinner and overnight stay in tents. After a short ascent from the lake is a steep descent through the forest to Bagga. Dinner and overnight stay in tents. The trial goes down hill through the forest. Rewa village is situated on the bank of a small river. Dinner and overnight stay in a village. It is a steep ascent through the forest to Galu temple. Dinner & overnight stay in Rest House. In the morning trek to Truind. Its the ideal place for camping. Overnight stay in tents/rest house. Today we will take half day sight seeing and by evening transfer to railway station to catch overnight train for Delhi.